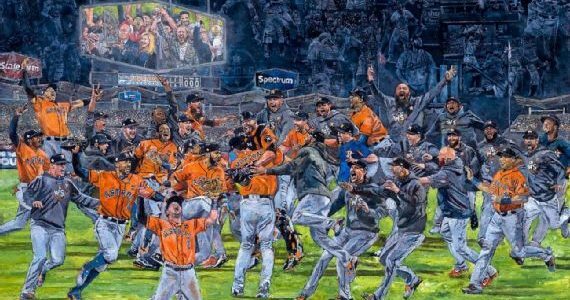 Relevant Communications / Posts tagged "Opie Otterstad"
Opie Otterstad, who has painted Major League Baseball’s official World Series Celebration art for 15 years, unveils the biggest work of his career Saturday. As the Chicago Cubs look to repeat history, revisit the team’s historic World Series run at “Cub Moment of Victory: The Exhibition. It took 108 years, but the Chicago Cubs finally broke their World Series curse and became champions in 2016! Relive the “lovable losers’” amazing win and celebration with this exhibition on display at Water Tower Place. MLB-sanctioned artist Opie Otterstad, noted for his work depicting each of the last 15 World Series celebrations, has commemorated the Cubs’ long-awaited win with the limited-edition piece “It Happened.” The painting captures the moment after the final out in Game 7 against the Cleveland Indians, when the team mobbed the field for the first time as champions.